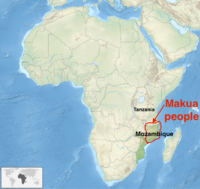 The Makua people , also known as Makhuwa, are a southeastern African ethnic group predominantly found in north Mozambique and southern border provinces of Tanzania such as the Mtwara Region. They are the largest ethnic group in Mozambique, and primarily concentrated in a large region to the north of the Zambezi River. A Makua mother and child in Mozambique. They are studied by sociologists in four geographical and linguistic sub-divisions: the lower or Lolo Makua, the upper or Lomwe Makua, the Maua and the Niassa Makua or Medo. They speak variants of the Makua language, also called Emakua, and this is a Bantu-group language. The total Makua population is estimated to be about 3.5 million of which over 1 million speak the lower (southern) dialect and about 2 million the upper (northern, Lomwe) version; given the large region and population, several ethnic groups that share the region with the Makua people also speak the Emakua. A mythical legend, in the oral tradition of the Makua people, tells that their ancestor were the first man and woman born of Namuli which is their original home, while other living creatures came from nearby mountains. Scholars are uncertain whether their origins are in the mountains, or west of Lake Malawi, or northern lands such as in Tanzania or the south. However they concur that they likely have been an established ethnic group in northern Mozambique region by the 1st millennium CE. The Makua people are closely related to the Animist Maravi people. They have had a history of conflict with the Muslim Yao people in the north involved in slave raids and slave trading. The Makua people have a documented history of metal ore processing and tools manufacturing. The colonial era Portuguese naturalist, Manuel Galvao da Silva for example, described iron mines of the Makua people. Similarly, the French explorer Eugene de Froberville summarized the indigenous Makua iron manufacturing methods from iron ore, where the Makua people extracted the metal by processing the ore in a wood-burning hearth as a community. The extracted metal was then worked into axes, knives, spear, rings and other items. 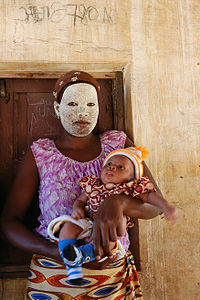 Musiro or n'siro is a traditional white paste mask applied by Makua women. The Makua people have traditionally been dedicated to agriculture and hunting, yet medieval era documents suggest that the Makua people were also successful traders that controlled the trade routes between Lake Malawi and the Atlantic coast doing brisk business with the Swahili (East Africa) and Gujarati (India) merchants before the start of the colonial era. However, prior to the 18th-century, the Makua population was primarily exchanging food, ivory tusks and metal products for textiles, salt and other products, but they were not involved in the trade of ivory or gold. The Portuguese who arrived in Mozambique in early 16th-century describe them for their trading relationships and expertise. The colonial settlers contacted the Makua people in early 16th century. The Makua people were generally peaceful with the colonial Portuguese in 17th century and through about the mid 18th century. However, with a rise in plantations, dramatic increase in ivory trade which required large scale killing of elephants,[note 1] and particularly slave raids that captured Makua people in the 18th-century, the Makua people retaliated with a war of attrition from 1749 onwards, against the Portuguese and those ethnic groups that supported the colonial interests, and against the Sultans on the African coast of Indian Ocean. In early 18th-century, states Edward Alpers, the primary demand for slaves out of Makua people, and Mozambique in general, came not from Portugal or its Indian Ocean colonies such as Goa because labor was readily available in South Asia and Portuguese colonial empire in Asia was small. The largest demand came from the 'Umani Arabs seeking slaves for domestic labor and the French who lacked plantation workers but controlled nearby island colonies such as Comoros, Réunion, Madagascar, Seychelles, Isle de France (now Mauritius) and others. With the growth of Portuguese interests in Brazil and of plantation owners from other colonial empires in the Caribbean, North and South America, the demand for slaves grew dramatically. The Makua people were one of the major victims of this demand, slave capture and export that attempted to satisfy this demand. The Makua people also became victims of the slave raids and capture from their north. The Yao people targeted them to meet the slave demand of Swahili Arabs centered around Zanzibar. After being victims of the slave raids and devastated communities, the Makua chiefs joined the lucrative trading in the 19th-century by becoming a supplier of slaves and raiding ethnic groups near them, selling the captured people to the same merchants and exporters. The exports of Makua people has led to this ethnic group's presence in many islands of the Indian Ocean such as Madagascar, the Caribbean, the United States and elsewhere. According to Palmer and Newitt, one of the strategies deployed by Africans and Arab slave raiders and traders was to dehumanize the Makua and Lomwe communities, by publicly stereotyping them as "barbarous and savage tribes", which made slave buyers between 1800 to 1880 feel justified and righteous in "exploiting, civilizing" them from their barbarous ways. In truth, state modern era scholars, the historical evidence and economic success of Makua people suggest that they were peaceful and industrious. The Makua people have predominantly held on to their traditional religion (66 to 70%), which reveres ancestors and nature spirits. The exception is the coastal population, where the Makua traders under the influence of their Swahili-Arab customers, converted to Shafi'i school of Sunni Islam. According to 19th-century colonial era records of Portugal that governed the Makua region, there was hardly any Islamic presence among the Makua people beyond the coastal settlements. The Makua people call the coastal Muslim people as the Maka, which may be derived from Mecca states Kroger, but is likely derived from "salt" or "coast" both of which in the Makua language is translated as Maka according to Alpers. The Makua people were widely distributed around the world during the colonial era. One of the oft studied ethnography of Makua people was published in 1847 by Eugene de Froberville, after he interviewed and learnt the Makua traditions and culture from over three hundred Makua people in Mauritius plantations. Makua people once lived in the country of South Africa in a Durban city called Bluff. However, due to the Apartheid era Group Areas Act, they were forcibly removed from Bluff and settled in Bayview, Chatsworth, Durban in 1960. Some Makua settled in Wentworth, Marianhill, Marianridge, Umlazi, Newlands East and West, Pietermaritzburg, Cape Town and Johannesburg. The Makua language, a Bantu language, is still predominantly spoken among the people, alongside Afrikaans and Zulu (in South Africa), Portuguese in Mozambique, some Swahili by the elders of the community but still spoken by many on the Tanzania-Mozambiqan border, and English in South Africa and Tanzania. ^ According to Newitt, the ivory trade had become so large that each caravan carrying ivory tusk had as many as 1,000 porters passing through Makua people lands. ^ a b c d e Andrew Dalby (1998). Dictionary of Languages: The Definitive Reference to More Than 400 Languages. Columbia University Press. pp. 386–387. ISBN 978-0-231-11568-1. ^ Anthony Appiah; Henry Louis Gates (2010). Encyclopedia of Africa: Kimbangu, Simon - Zulu, Volume 2. Oxford University Press. p. 116. ISBN 978-0-19-533770-9. ^ Godfrey Mwakikagile (2013). Africa at the End of the Twentieth Century: What Lies Ahead. New Africa Press. pp. 136–137. ISBN 978-9987-16-030-3. ^ a b c d e f M. D. D. Newitt (1995). A History of Mozambique. Indiana University Press. pp. 62–65. ISBN 0-253-34006-3. ^ Hilary C. Palmer; Malyn D.D. Newitt (2016). Northern Mozambique in the Nineteenth Century: The Travels and Explorations of H.E. O’Neill. BRILL Academic. pp. 154–158 with footnotes. ISBN 978-90-04-29368-7. ^ Hilary C. Palmer; Malyn D.D. Newitt (2016). Northern Mozambique in the Nineteenth Century: The Travels and Explorations of H.E. O’Neill. BRILL Academic. p. 223 with footnote 17. ISBN 978-90-04-29368-7. ^ Edward A. Alpers (1975). Ivory and Slaves: Changing Pattern of International Trade in East Central Africa to the Later Nineteenth Century. University of California Press. pp. 8–9. ISBN 978-0-520-02689-6. ^ Louis Brenner (1993). Muslim Identity and Social Change in Sub-Saharan Africa. Indiana University Press. pp. 80–82. ISBN 0-253-31271-X. ^ Anthony Appiah; Henry Louis Gates (2010). Encyclopedia of Africa. Oxford University Press. p. 600. ISBN 978-0-19-533770-9. ^ a b c d Edward A. Alpers (1975). Ivory and Slaves: Changing Pattern of International Trade in East Central Africa to the Later Nineteenth Century. University of California Press. pp. 10–11. ISBN 978-0-520-02689-6. ^ Hilary C. Palmer; Malyn D.D. Newitt (2016). Northern Mozambique in the Nineteenth Century: The Travels and Explorations of H.E. O’Neill. BRILL Academic. pp. 160–161 with footnote 30. ISBN 978-90-04-29368-7. ^ Mary Fitzpatrick (2010). Mozambique. p. 134. ISBN 978-1-74104-888-9. ^ Edward A. Alpers (1975). Ivory and Slaves: Changing Pattern of International Trade in East Central Africa to the Later Nineteenth Century. University of California Press. pp. 11–12. ISBN 978-0-520-02689-6. ^ M. D. D. Newitt (1995). A History of Mozambique. Indiana University Press. pp. 177–178. ISBN 0-253-34006-3. ^ M. D. D. Newitt (1995). A History of Mozambique. Indiana University Press. p. 184. ISBN 0-253-34006-3. ^ Bethwell A. Ogot (1999). Africa from the Sixteenth to the Eighteenth Century. University of California Press. pp. 310–311. ISBN 978-0-520-06700-4. ^ M. D. D. Newitt (1995). A History of Mozambique. Indiana University Press. pp. 75–76, 177–184. ISBN 0-253-34006-3. ^ Edward A. Alpers (1975). Ivory and Slaves: Changing Pattern of International Trade in East Central Africa to the Later Nineteenth Century. University of California Press. pp. 67 note 38. ISBN 978-0-520-02689-6. ^ a b Edward A. Alpers (1975). Ivory and Slaves: Changing Pattern of International Trade in East Central Africa to the Later Nineteenth Century. University of California Press. pp. 94–97, 126–129. ISBN 978-0-520-02689-6. ^ Hilary C. Palmer; Malyn D.D. Newitt (2016). Northern Mozambique in the Nineteenth Century: The Travels and Explorations of H.E. O’Neill. BRILL Academic. pp. 5–6, 61–66, 72–75, 123–124. ISBN 978-90-04-29368-7. ^ Louis Brenner (1993). Muslim Identity and Social Change in Sub-Saharan Africa. Indiana University Press. pp. 81–82. ISBN 0-253-31271-X. ^ Bethwell A. Ogot (1992). Africa from the Sixteenth to the Eighteenth Century. University of California Press. pp. 771–775. ISBN 978-0-435-94811-5. ^ J. F. Ade Ajayi (1989). UNESCO General History of Africa, Vol. VI: Africa in the Nineteenth Century Until the 1880s. University of California Press. pp. 185–189. ISBN 978-0-520-03917-9. ^ Edward A. Alpers (1975). Ivory and Slaves: Changing Pattern of International Trade in East Central Africa to the Later Nineteenth Century. University of California Press. pp. 95, 257 with footnote 73. ISBN 978-0-520-02689-6. ^ Godfrey Mwakikagile (2013). Africa at the End of the Twentieth Century: What Lies Ahead. New Africa Press. p. 136. ISBN 978-9987-16-030-3. , Quote: "They included the Makua of southern Tanzania and northern Mozambique. Some of the Makua captives were among those who were sold on the auction block in the state of Louisiana in the southern part of the United States." ^ Celeste Ray (2014). The New Encyclopedia of Southern Culture: Volume 6: Ethnicity. University of North Carolina Press. p. 64. ISBN 978-1-4696-1658-2. , Quote: "Throughout the 18th century, some Congo could be found in Louisiana, and Africans from Mozambique (almost entirely Makua) were transshipped to Louisiana from St. Domingue/Haiti." ^ a b Hilary C. Palmer; Malyn D.D. Newitt (2016). Northern Mozambique in the Nineteenth Century: The Travels and Explorations of H.E. O’Neill. BRILL Academic. pp. 27–29 with footnotes. ISBN 978-90-04-29368-7. ^ a b Hilary C. Palmer; Malyn D.D. Newitt (18 January 2016). Northern Mozambique in the Nineteenth Century: The Travels and Explorations of H.E. O’Neill. BRILL. pp. 63–67. ISBN 978-90-04-29368-7. ^ Megan Vaughan (2005). Creating the Creole Island: Slavery in Eighteenth-Century Mauritius. Duke University Press. pp. 267–268. ISBN 0-8223-3399-6.